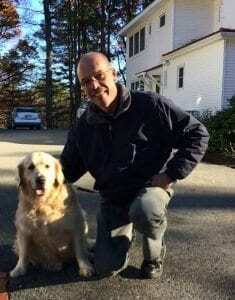 Volunteer Transport from start to finish - Yankee Golden Retriever Rescue, Inc.
Four and a half years ago, in 2012, we drove up the driveway at Riverview to meet a dog that we didn’t know, hoping that he would like us and want to come home with us. We had lost our only sweetheart Abby, just a few months before and the wounds were still raw. To say that we were both excited and vulnerable would be an understatement. The minute that Bailey (4967) walked through the door in the Home Simulation room, we knew that we were meant to be together. Bailey is 12 ½ now, and he picked up a “sister”, Daisy (4989) along the way, and even though they never met before coming to YGRR, they act like they are littermates now. Even though we’ve had our share of struggles and illnesses along the way, we can’t imagine life without them. I have a feeling that many, or most of you, understand this feeling all too well. Each role has its own responsibilities, and there are some of you reading this now that I’ve done a Home Visit for. Home Visits are very special, seeing the hopeful look on a prospective adoptive family, just like we had back in 2012. If the Home Visit goes well and the family adopts from us, the post-adoption stories are extremely meaningful, especially since I know that feeling so well. These stories are the best part of this “job” and I love them all. The transportation role was the one I was the most unfamiliar with and the most nervous about. From the time of pick up to the time pulling into Riverview with the surrendered dog, the emotions swing wildly, from sadness and comforting, to a hopeful new beginning. I’ve had dogs who could not relax, spending the entire ride panting and looking out the window, while I wonder what they are thinking, while others have curled up and slept by the time I backed out of the driveway. Then Allyson and Susan brought our first dogs in from Turkey, and right when I thought I’d experienced everything, everything changed. 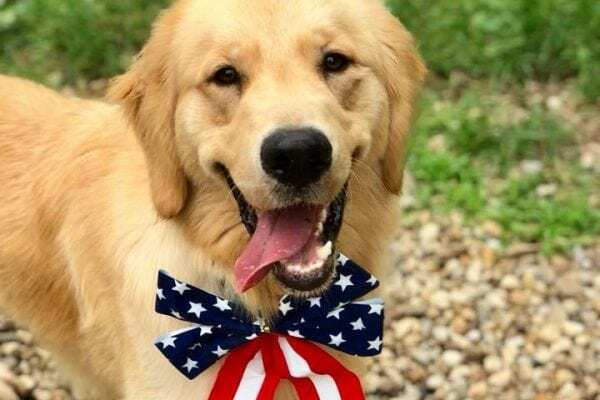 The entire concept of a dog in Turkey, arriving in Hudson, with the help of numerous volunteers, a transatlantic flight and a ride from New York to Riverview is almost too much to wrap your head around, yet this is what we’ve been doing. I kept hearing stories about the life-changing moments when we picked up dogs at the airport and I was hooked. I needed in on this. My first opportunity came early in 2016 with a flight that was due to come into Logan Airport in Boston. We had a need for transportation volunteers and I was available. So far, we’ve had two potential pick up locations, JFK in New York and Logan in Boston. A JFK arrival usually means the dogs are coming over on a cargo plane and a Logan arrival means the dogs come over with a flight volunteer on a passenger jet. I enlisted the help of our youngest son Brendan, who is a student at WPI and has the aptly named Honda Odyssey minivan. The day arrived for our pick up, Brendan met me at Riverview and we drove into Logan. We waited anxiously for the flight to arrive and for the two dogs to appear, not knowing what to expect. As the passengers started streaming out of the customs exit in the Logan Airport International terminal, we looked over the crowd (we’re both tall) to see if we could catch a glimpse of…. what we didn’t know. The crowd thinned and an airport worker with a pushcart that had a very unusual cargo appeared. I looked into the crates and locked eyes with one of the dogs and felt an instant connection. The worker was anxious to get the dogs out of there and I had some paperwork to sign, so Brendan went with the dogs to the van, and I went through the paperwork, barely able to pay attention. I ran out to the van, and as I approached, I did not see Brendan in the passenger seat. My immediate thought was that something terrible had happened between the terminal and our car, but how was that possible? I was literally parked across the street from the building. Had the dogs gotten loose somehow? I reached the car and peered in the window and saw Brendan, sitting in the back on the floor, between both crates, comforting two scared dogs. At that moment, I could not have been more proud of him. I’d done transports before, but never with two dogs, who had been in Turkey 12 hours ago, and who we had just picked up at the airport. What would they be like on the ride to Hudson? In a word, “sleepy”. This was about as uneventful a transport as you could get, which is exactly what we wanted. We pulled into Riverview with instructions in my head to get them into their kennels without any interaction with any other dogs. We opened the back of the van and I started to think to myself “Just don’t lose the dogs now”. Pulling a dog, that you don’t know, out of a crate can be a delicate task. Each dog and every situation is different, but there is a moment in time that is most dangerous, when you open the crate door and don’t have the dog on a leash yet. We hooked up the first dog and he hopped out of the van like he’d been there his whole life. I handed the leash to Brendan and considered the second crate where I saw a very scared dog, curled into the back of the crate. This wasn’t good, and I wanted to be sure that I had the same number of fingers on my hands after this as I did when I started. A dog that you don’t know is one thing, but a SCARED dog in a crate is another thing entirely. You could ask 10 different people how to get the dog out, and you might get 10 different answers. I needed to get a sense of how dangerous this dog was, so I climbed into the back of the van and sat against the crate. No reaction, no whining, no whimpering, so I opened the door and waited and…. nothing happened. Great…now I can either tip the crate or stick my hand in and those same 10 people may tell you that what I did next was something that I shouldn’t have done, but I reached in, hooked her up and brought her out, still with 10 fingers on my hands. She was trembling slightly, and would not hop down from the van, so I carried her to the ground, and she would not move. I didn’t want to drag her in, so I asked Brendan to walk ahead of us and she followed them into their kennels. By the time we left, she had settled in, eaten some and was laying down on her bed. The next morning, I wrote an email to Allyson, babbling on about this amazing experience and how nothing at all could be any better than this. I received a short reply, “Just wait until you do a cargo.”. I replied with something like “You mean it’s better than this?” and the reply of “Yes” was all I needed to hear. As we approached June we confirmed that we would be bringing in 18 dogs and they would be arriving at JFK in New York. This would be a full-scale cargo transportation effort with volunteers at JFK, for transportation to Hudson and at Hudson. The logistics effort involved with this type of transport is staggering. People and organization was needed not only at JFK, or Hudson, or in between, but also in Turkey. We started putting a group together for the transport and I volunteered without realizing that I needed a co-pilot for the trip. 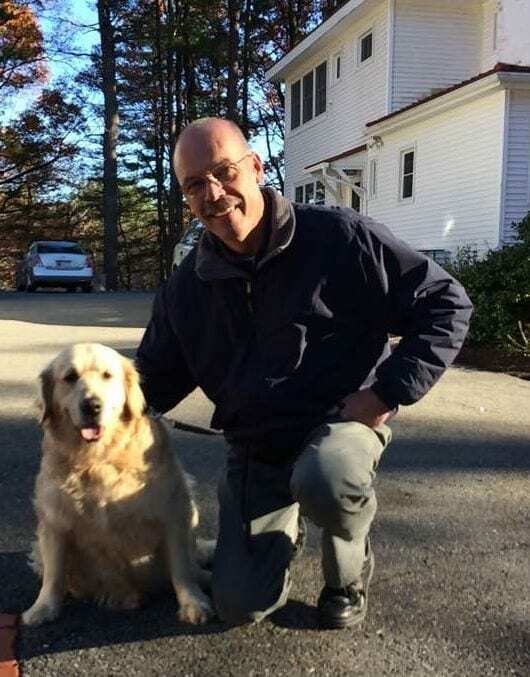 I approached my friend Sharron Kahn Luttrell, author of “Weekends with Daisy”, with an offer of “How would you like to drive to New York City, at night, in a 12-year-old minivan, to pick up a bunch of Golden Retrievers, and then drive them back to Hudson, and did I mention that we’d be up most of the night?”. Apparently, this was an offer she couldn’t refuse as her only response was “I’ll bring snacks!”. The day arrived, we climbed into the car and off we went, talking the entire way down about what it might be like, even though neither of us knew. We arrived at a (very) large building, with many loading docks, trucks and a lot of noise. We waited around, talking with people that had done this about what it was like, wishing the plane could go faster. 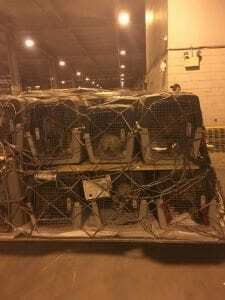 Then…suddenly, a forklift, pushing a pallet, with 9 crated dogs on it. As we tried to comprehend what we were seeing, another forklift, pushing another 9 dogs arrived. 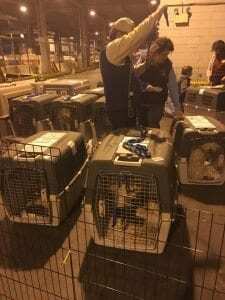 All the staff and volunteers immediately started talking to the dogs, cooing endlessly to them, as the airport workers quickly removed the strapping holding the crates in place. Each person, without thinking, subconsciously picked out a favorite, and then people sprang into action. Kennel Manager, Lucille Brooks, had this down to a science. X-pens were constructed, volunteers and staff started double leashing dogs, and handing them off to volunteers, with Sharron taking notes and snapping pictures as quickly as possible so she didn’t miss anything. She only stopped when she was handed Mario’s leash. I’d like to say that it was meant to be, but I did position myself in just the right place and was handed the leash to “Daisy”. I resisted the overwhelming urge to give her the biggest hug and kiss because she’d been crated for a long time and probably needed to “go”. Off we went, across the parking lot to a grassed in area, where I got to spend time with “my” girl. Even though we have an incredible staff and dedicated volunteers who are all probably more knowledgeable than I am, I now felt like I alone, was responsible for Daisy. We walked around some, and went back to the loading dock, where crate cleaning was in full swing. I participated for a while but it felt as if I stood there long enough, a volunteer was going to spray me with disinfectant too, so I stayed out of the way. Crates were cleaned, put back together, and we started to bring vehicles to the dock to load up the crates for the ride back. One by one, a vehicle was loaded with 2 or 3 crates, and with a pilot and co-pilot, off into the night it went for the journey to Hudson. Then it was our turn, 3 crates were loaded and we were off. Now, we alone, were solely responsible for the three dogs who, earlier that day, were in Turkey. 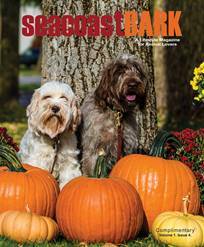 Just like the trip in Boston, these remarkable dogs figured out the routine and settled down, literally not making a peep for the entire ride. We pulled into Riverview 3 ½ hours later, and were met with MORE volunteers, who offloaded the van, did NOT lose a dog, got the dogs into the kennels while we went to the Home Simulation Room, which was well stocked with needed refreshments. For the next hour or two, another vehicle would pull in and the offload happened again, until finally, all 18 were home and it was then that I realized, Allyson was right, this WAS better. For a few weeks after this, I would stop by Riverview to see “my” girl, until the day she was adopted, thus completing her journey. Then, after finally coming down from this experience, the word came out that we were going to do another one at JFK, although slightly smaller. This time we were “only” going to take 8 dogs, or one pallet. After what happened last time, how could I say no to this? 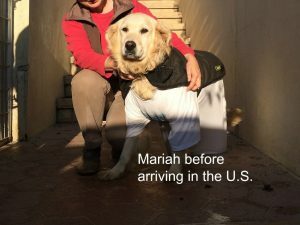 The arrival dates and time fluctuated, which is an unfortunate by-product of international cargo, especially international cargo involving dogs. After a few false starts, the day arrived. This time, the arrival time wasn’t too late in the day, removing the need for a co-pilot. I was going solo this time, however, I had picked up a trailer, as volunteer/member/previous Turkish adopter Cindy wanted in on the fun. We met along 95 in Connecticut, and she followed me down to JFK. There were a few delays at JFK, and when you are waiting for “your” dogs to arrive at the airport, the slightest delay seems to take hours. We were in a different cargo building this time, with less room and more noise and commotion, and the only grassy area a good 100-yard dash to the end of the parking lot. I guess they didn’t take dogs into consideration when designing the building and parking lot. More waiting and then…. on the far side of the building, barking….is that barking we hear? Then we see them, and then we must wait more as forklifts whizzed back and forth picking up boxes and pallets, but not OUR pallet. Finally, the right forklift came around the corner and the crates were unwrapped and we started handing off dogs. We shared this transport with our friends at Delaware Valley Golden Retriever Rescue, so unloading the crates was a little more complicated, but all the dogs went out, I was handed Pepsi’s leash and we did our best 100-yard dash so she could “go”. We proceeded to stroll and sniff while volunteers disassembled the crates, cleaned them and reassembled them. By the time we got back, all the crates were ready to go, so we started loading vehicles, although we did it a little differently this time. If you walked a dog, and were in a transport vehicle, “your” dog went back to Riverview with you. Cindy’s SUV was already loaded and it wasn’t too late so, off she went. I was loaded up near the end, and since it was just me, it was me, Pepsi, 4 disassembled x-pens and 6 disassembled crates for the ride back to Hudson. The fantastic people who loaded the van did a great job of positioning Pepsi so I could drive with one hand on the wheel, with my other hand in the crate with her. We decided to non-stop the trip, and managed to get back first, followed shortly by everybody else. With a flurry of activity, all 8 dogs had arrived home, were starting to settle into their kennels and had started to adjust to the next phase of their life. I’ve been back twice so far and Pepsi is already more relaxed. These dogs have been through quite a journey, and despite where they have been, and the conditions that they have endured, their outlook when we open the door to their crate was to look to us and not question us, but to give their trust to us, looking to us to keep them safe and trusting that we would do the right thing. Cindy compared the experience of bringing dogs out of the crates to a metamorphosis, like Golden Butterflies, emerging from their cocoons to a new, wonderous life. We owe them this, especially after everything they have been through. We are their protectors and we will keep them safe and find them a loving home. These transports have been an incredible experience, which have affected me mentally, helping to change my overall outlook. The unshakable love these dogs have for us is a reminder to each of us that we can all be better people so we can be good enough for them.